The Bulls have had worse games this season than Friday’s 100-88 loss to the Miami Heat, though Bulls coach Fred Hoiberg declared it the team’s worse game. The blown 10-point lead to Atlanta earlier this week comes to mind as well as some brutal nights in Wisconsin, and with nothing to do with the brats and beer. But this game with Jimmy Butler and Dwyane Wade coming off the bench, the game coming a few hours after what was characterized as a brutally honest team meeting to air and perhaps resolve some grievances, was a game perhaps as much as any the Bulls wanted to win. Not so much to get back to .500, but to get back to some semblance of basketball after the searing several days of soul searching that followed the recriminations by Butler and primarily Wade in the wake of that loss to the Hawks. 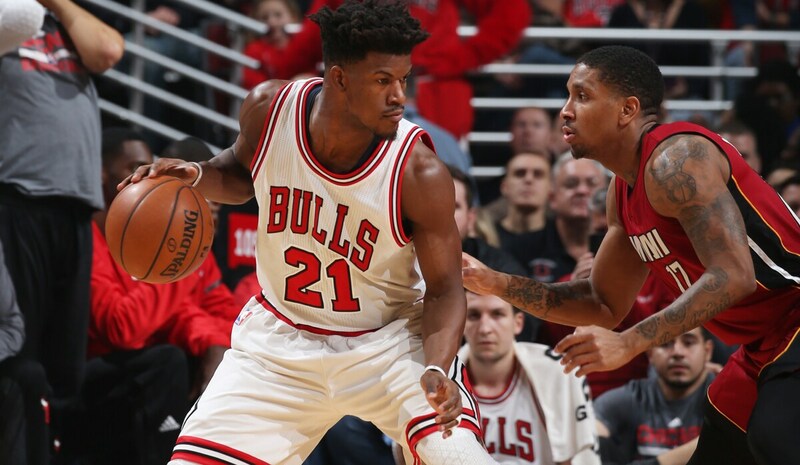 The Bulls slipped to 23-25 in losing to a Heat team that won its sixth straight, but is 17-30 and without center Hassan Whiteside and regulars like Tyler Johnson and Justise Winslow. Wade’s alma mater bolted out to a 33-24 first quarter lead as Butler and Wade sat the first six minutes, and then saw the Bulls charge back to tie at 53 at halftime. But then the Bulls fell behind by 15 points late in the third quarter and never really get close after that. The Bulls in that third quarter had a merciless stretch in which after trailing 63-61 on a Robin Lopez hook with 7:31 left, the Bulls missed 12 straight shots, three of four free throws and committed a pair of turnovers. The Bulls shot four of 20 for the quarter, Butler and Wade, who started the second half, a combined zero for nine in the quarter as they tried any which way but in to get the ball in the basket, and it was too much to overcome. “I think we lost to a team that is playing very well lately and we just have to continue to get better,” Wade said in his most succinct post game remarks of the season. Wade had 15 points on six of 17 shooting while Jimmy Butler had an uncharacteristic three points on one of 13 shooting, a lopsided team high minus-23 for time on the court. "I’ll be back, I promise. I will be back. I’m not worried about it at all. I’m going to take the same shots next game and the game after that, and they’ll go in. I’ve just got to be better. coming off the bench, starting, whatever it may be; that’s my job, be better." Paul Zipser started for Butler and had 14 points, 12 in the first half. Doug McDermott started for Wade and had nine points. He shot three of six. It was Rajon Rondo, the other end of the weeks’ contretemps, who played the best among the three with 13 points, seven rebounds and seven assists, making six of eight shots, mostly jumpers, and with a team high plus-eight when on the court. “We got some great looks, but we had 20 turnovers (for 26 Miami points) and when you do that a team that runs the floor causes problems. I believe we still are optimistic about the season; my expectations are pretty high, as well. I look forward to getting back (to practice) tomorrow, getting to work. I’m going to watch film tonight, break it down, see what we can do better as a team and get back at it. Play hard, run the floor, take open looks and play defense; it’s a simple game. And so yet another crucible for this roller coaster ride in a fun house team that has offered hope and promise amidst despair and disappointment. The events have been well chronicled of late, the meltdown loss Wednesday, the post game criticism by Wade and Butler, Rondo’s social media response defending the reserves, a long team meeting basically instead of shootaround practice Friday morning, team fines for the onetime Alphas, and then each facing a combined half hour of media questions. Now, fellas, let’s have fun and play a game. It wasn’t about to happen as much as they were obviously ready to get past all of this. And hoping it might. Butler, especially, who wasn’t particularly direct in any of his comments Wednesday other than sort of doing a whatever he said thing with Wade. Butler was first in with just over five minutes gone and the Bulls trailing 18-15. It was 27-15 Miami two and a half minutes later. But Butler seemed really to be trying, even too hard, almost aiming his shots, making a point to find teammates, which apparently was a talking point. 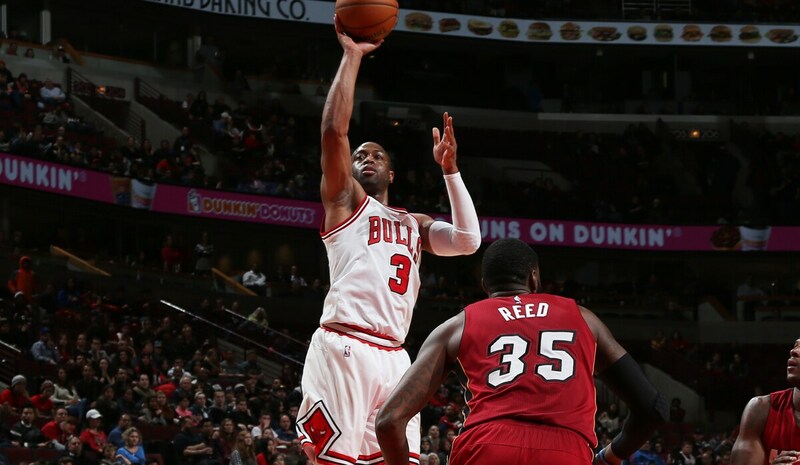 Somewhat so with Wade, who looked like he was trying to score 20 points with each shot. It led to multiple turnovers and runouts that helped Miami to 22 fast break points. Goran Dragic led Miami with 26 points and 11 assists, his name in trade rumors, too, with Miami’s poor season. Emergency center Willie Reed had 20 points and Dion Waiters 19. 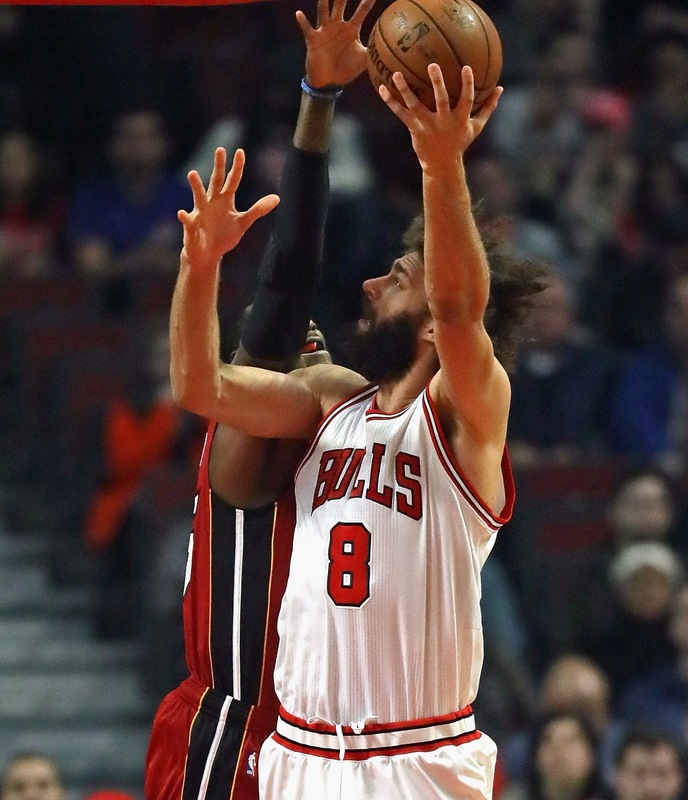 “Guys played hard,” said Taj Gibson, who had 14 points and four blocks and was his usual tenacious self. “Sometimes even when you play hard, you get jittery and have a few turnovers; the effort was there. At times it was just tough to make shots. “Just knowing how the team felt, we really wanted to win that game,” Gibson acknowledged. “Having the emotional morning. We had a chance, had good spirit. Everything was going right and sometimes it doesn’t go your way. That team was a hot team coming in; we knew we would get their best. Things just didn’t go our way. "Talking is always good; it was positive from this morning. We came together, hugged. Now got to come back out and put your work in, not put pressure on yourself; go out and play." And so it is for the Bulls now, facing a hot 76ers team and perhaps rookie sensation Joel Embiid and then the toughest road trip of the season, six games against some of the Western Conference’s best. With all the Bulls have endured, they remain eighth in the Eastern Conference. It’s hardly a goal, but it’s also not judgment day. Wade wasn’t rude or unwelcoming, but he also knows he’s heaped as much pressure on himself with his remarks as his teammates. So he seemed to stick with some veteran inspiration, from Shaq’s shamming, his Short Answer Method, to Rasheed Wallace’s view that Both Teams Played Hard.